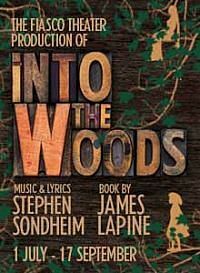 It has just been announced that Harry Hepple, Steffan Lloyd-Evans and Laura Tebbutt are taking over as The Baker, Wolf/Cinderella's Prince and Baker's Wife in Into The Woods at the Menier Chocolate Factory from 9th August, replacing Ben Steinfeld, Noah Brody and Jessie Austrian in Fiasco’s production of Stephen Sondheim and James Lapine’s classic musical. Using ten actors and multiple musical instruments, Into The Woods runs until 17th September 2016. The rest of the company includes original U.S. cast members Paul L. Coffey (Mysterious Man), Andy Grotelueschen (Milky White/Rapunzel's Prince), Liz Hayes (Jack's Mother/Stepmother), Claire Karpen (Cinderella/Granny), Patrick Mulryan (Jack/Steward), Vanessa Reseland (Witch) and Emily Young (Little Red/Rapunzel).